This photo eye is primarily used for safety. The reflective photo eye is great for driveways that are difficult to run wire under. On the primary side of the driveway (the side with the control box) simply run wire down to the photo eye and mount it on a small post in the ground. Then arrange the reflector up to 18' away on the opposite side of the driveway and reflect the beam from the eye back to the eye. If any object breaks the beam it will get a reaction out of the gate opener. With the Estate Swing Vinyl Series openers there are many options for what you would like to the gate opener to do in different positions when the photo eye beam is broken. 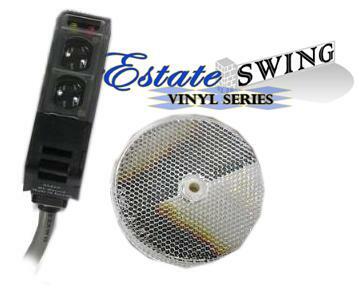 Also all Estate Swing Vinyl Series gate openers are equipped with dual safety circuits, a separate for opening and closing cycles. This way you can have two or more photo eyes set up, to catch obstacles only on the opening cycle, closing cycle or both. This provides you with the largest amount of options for safety customized to the way you need it.